Google continues to improve its applications for the iPhone. 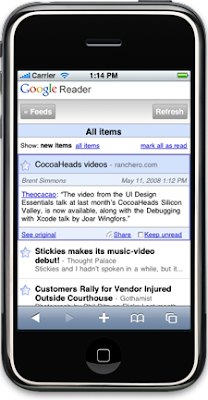 The latest perk is a new version of Google Reader designed for the iPhone and other mobile phones with "advanced browsers." Check it out here. Google Reader is essentially the company's RSS feed, allowing users to check their favorite news sites and blogs for fresh copy. Google said users can scan the titles for an item that interests them and tap it on that lovely iPhone touch-screen to watch it expand. Content may be starred, shared or kept unread in place, so users never have to leave the list view or refresh the page. No word on whether it will be synchronized with the desktop Google Reader, but one suspects that this will be the case in the final version. It's a very clean user experience from the desktop, an experience that has been more closely mapped to the iPhone. This is going to become more crucial as the stakes in the mobile search and advertising wars begin to soar. The companies, chiefly Google, Yahoo and Microsoft, who are first to match the desktop user experience on smartphones and other wireless gadgets may leapfrog over the others in the market. But this will probably be a zero-sum affair, with the market leaders all porting the user experience of their desktop apps to their mobile versions of the software. Google Reader is a smaller mobile perk than, say Google Search of ads on mobile devices, but every little bit will count. Google is ahead anyway simply by virtue of making a lot more Web apps than Microsoft or Yahoo.